Henrik Bjerresø writes: I am a collector of all kinds of frog and frog-related items. One of my friends recently gave me a burnt clay frog stamp. He is a world traveller and does not recall where he bought it (several years ago). It is an inexpensive modern thing, so there is no claim to antiquity, but I would like to find out its origin. The pattern on the bottom of the statue seems to me to correspond nicely with some of the patterns on the Mexicolore web site. The size is 70 x 55 mm. At the back of the frog there is a small hole (diameter app. 4 mm), which could have served as an incense stick holder, except for the fact that it is horizontal, so not very well suited to that purpose. 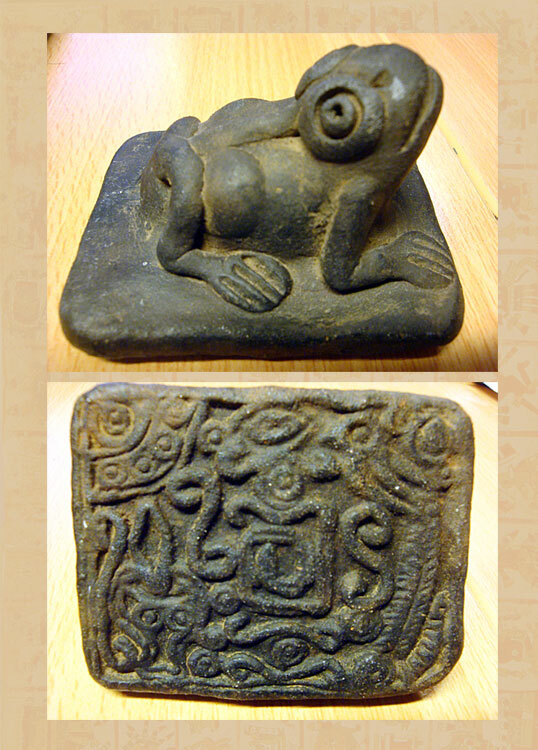 It is actually very deep, so probably the frog figure is hollow to avoid cracks during the burning process. A very nice detail for such a simple item. I would appreciate your comments on the stamp pattern, and possibly the use of the frog in Aztec pottery. Very interesting stamp. Never seen anything quiet like it. The hole is to avoid it from being cracked. Incense sticks originated from Asia. I’m leaning more towards that it was made to be a tourist item since the stamp is flat (usually they’re curved) along with the image on this stamp being a bit “chaotic”. Frogs are associated with the underworld.